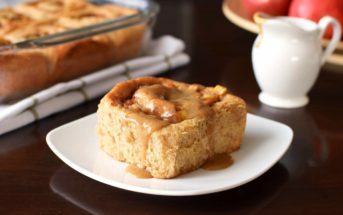 It’s becoming quite easy to find “free-from” desserts, but creative, convenient, and wholesome entrees are still hard to come by. Fortunately, Hook Line and Savor is shoring up several varieties of prepared seafood products that are high quality, amazingly delicious, and allergy-friendly. 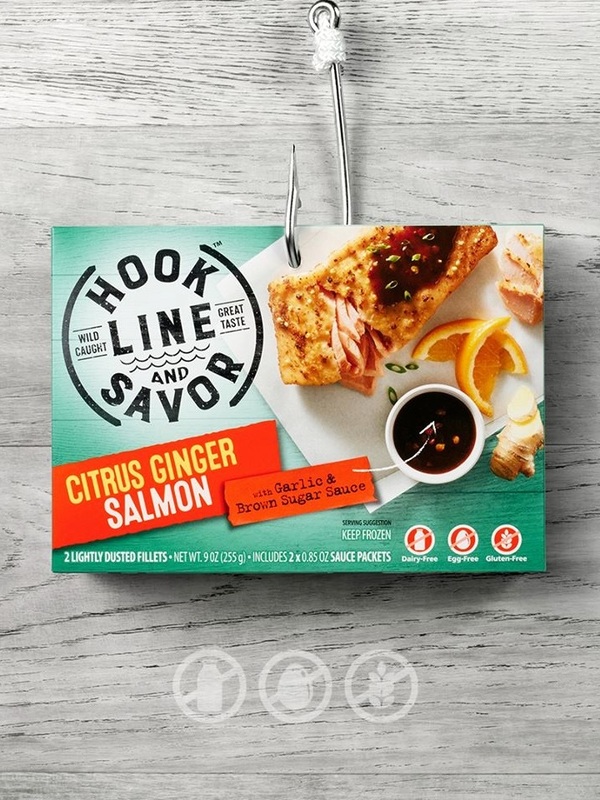 Hook Line and Savor is a new brand of dairy-free, gluten-free, and egg-free seafood entrees that’s reeling us in with enticing flavors and transparent practices. Their initial line of wild-caught fish includes Black Bean Crusted Cod with Roasted Corn & Red Pepper Salsa, Citrus Ginger Salmon with Garlic & Brown Sugar Sauce, and Crispy Beer Battered Haddock with Classic New England Tartar Sauce. Honestly, I try to be virtuous when grocery shopping. But dairy-free is my top priority, so I sometimes sacrifice on quality, sourcing, or nutrition when placing items in my cart. But Hook Line and Savor is the whole package, from allergy management to sustainably-sourced ingredients. They believe taste, quality, and allergy-friendly should not be mutually exclusive. 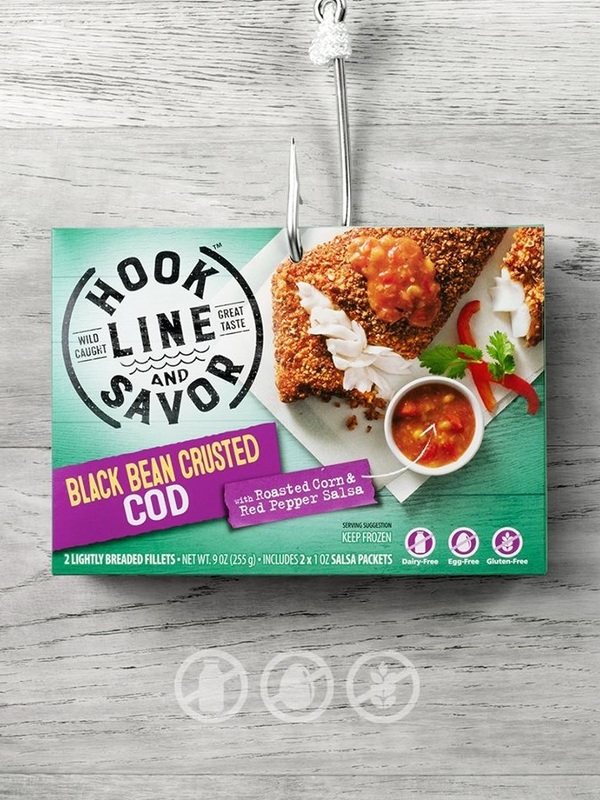 All Hook Line and Savor seafood is made without dairy, eggs, gluten, tree nuts, peanuts, and soy. And they take pride in the rigor of their allergen management program to ensure their products are safe for those with food allergies and intolerances. For dairy, gluten and egg, they test incoming and finished products using the ELISA (enzyme-linked immunosorbent assay) test method. Gluten is tested to confirm levels below 20 ppm (the level determined safe by the FDA). Dairy and egg are tested to the limit of detection or 2.5 ppm. See their Allergy FAQs to learn more – they have kindly shared so much detail and information! This is the fish you would use if you were cooking from scratch at home. It’s cut from wild-caught whole fillets, not treated with any solutions or chemicals, and frozen fresh. And Hook Line and Savor doesn’t skimp on flavor. It was their team’s mission to create inspired recipes that friends and family, with or without dietary restrictions, could easily enjoy together. Hook Line and Savor is so proud of the wild fish they use that they print a catch code on the top of each carton. The code allows consumers to look up where and how their fish was caught. Hook Line and Savor has also partnered with the Anderson Cabot Center for Ocean Life at the New England Aquarium. They are on the cutting edge of sustainability science and innovation to ensure continuous improvement in responsible sourcing practices. And Hook Line and Savor donates 5% of profits for each item sold to SeaShare. This is a non-profit dedicated to increasing the amount of high-quality seafood available at food banks and feeding centers across the country. Why Does Hook Line and Savor Care So Much? Frederica (aka Freddie), the founder of Hook Line and Savor, has a son who was diagnosed with several life threatening food allergies as an infant. Grocery shopping yielded some good options for her family’s new needs, but she quickly realized there were no prepared seafood products they could enjoy together. So she and several of her coworkers at Gorton’s Seafood came together to create delicious allergy-friendly recipes that they felt good about feeding to their families. The development team at Hook Line and Savor has a variety of food restrictions, so they have crafted cuisine that’s suitable for many allergic and dietary concerns. But they were also inspired by delicious recipes, have a craving for good quality seafood, and are committed to sustainability and giving back to the community. Because at the end of the day, we all live on the same planet. You can find out more about their story at hooklineandsavor.com. This post is sponsored by Hook Line and Savor. These deep down delicious entrees currently come in three varieties. Below I’ve included some details on the taste, full ingredient lists, and the allergen disclaimers. 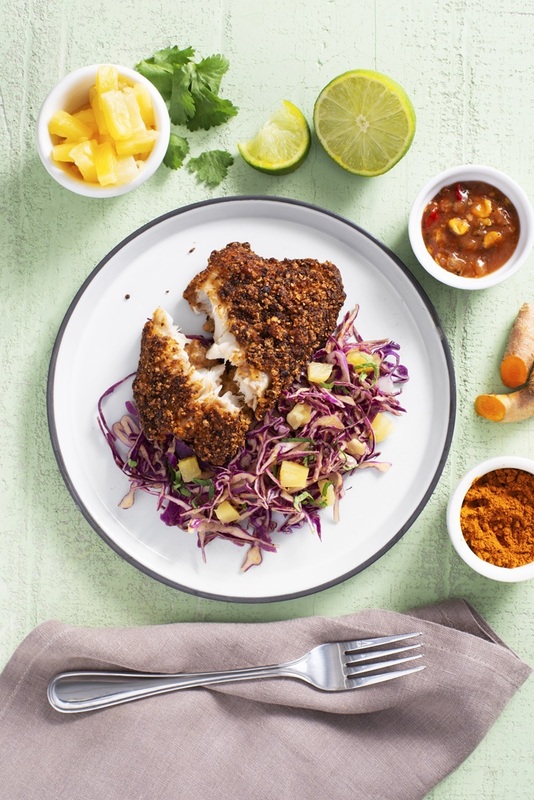 These flaky wild-caught cod fillets are lightly crusted with a crunchy blend of black beans, onion, garlic, jalapeño pepper, lime and spices. It’s a high-protein option that also boasts fiber and potassium. Salsa Ingredients – Water, Corn, Tomatoes, Red Bell Pepper, Tomato Paste, Jalapeño Pepper, Distilled Vinegar, Dehydrated Onion, Sugar, Cilantro, Corn Starch, Salt, Dehydrated Garlic, Lime Juice Concentrate, Spices (cumin, black pepper, chili pepper), Xanthan Gum, Citric Acid. 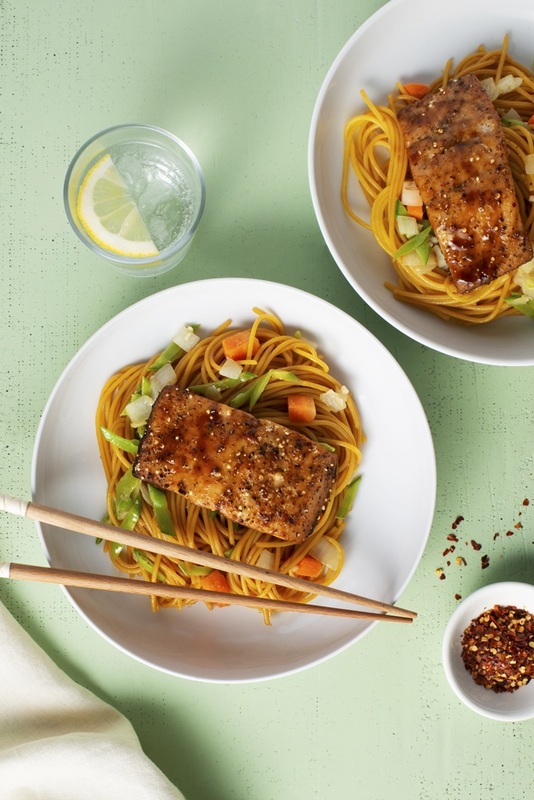 These wild-caught salmon fillets have an Asian flair. They’re seasoned with a savory blend of millet, lemon and orange zest, ginger, garlic and green onion, and served with a lightly sweet and flavorful sauce. Sauce Ingredients – Water, Brown Sugar, Molasses, Ginger Puree, Rice Wine (Rice, Salt), Natural Flavor, Yeast Extract, Rice Vinegar, Canola Oil, Natural Umami Flavor (Fermented Rice Extract, Corn Starch, Shiitake Extract, Kombu Extract), Corn Starch, Garlic Puree, Xanthan Gum, Lime Juice Concentrate, Dehydrated Green Onion, Dehydrated Red Pepper, Spices (white pepper). 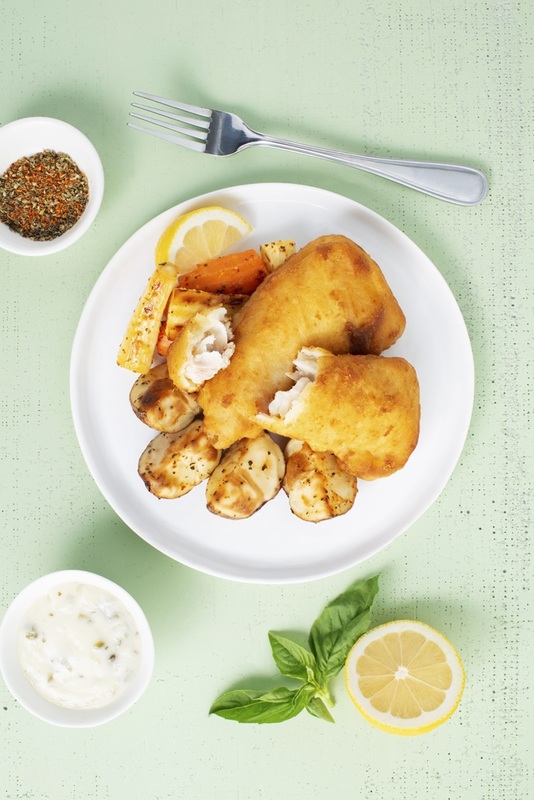 These flaky wild-caught haddock fillets were inspired by the seafood shacks on Cape Ann in Massachusetts. 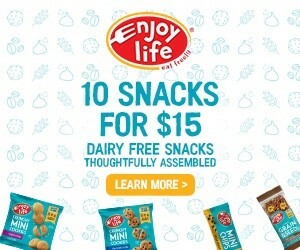 But they’re dipped in a dairy-free, egg-free, and gluten-free blonde ale batter for a perfectly crisp bite that everyone can savor. Sauce Ingredients – Canola Oil, Water, Cucumbers, Onions, Modified Corn Starch, Capers, Distilled Vinegar, Salt, Sugar, Acacia Gum, Dill Emulsion, Sea Salt, Lemon Juice Concentrate, Parsley, Xanthan Gum, Beta Carotene (Color), Spices (ground mustard seed). 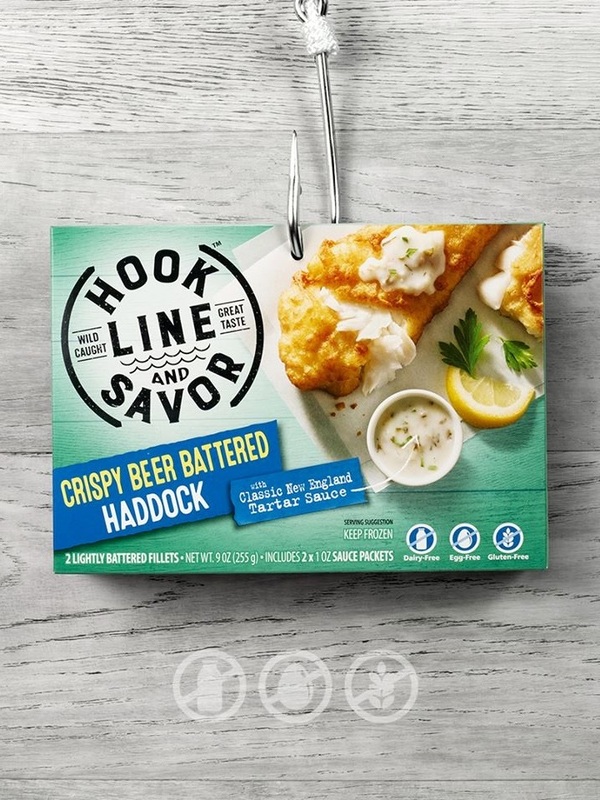 Availability: Hook Line and Savor products are available in the freezer section at select Kroger’s (Ohio, Michigan and West Virginia) and Price Chopper’s (New York, Connecticut, Massachusetts, New Hampshire, Pennsylvania and Vermont). Look for them at select Wegmans locations starting in March, too. And they should start popping up in natural grocery stores later this year! Don’t be hesitant to ask your grocer to order Hook Line and Savor if they aren’t in stock yet. 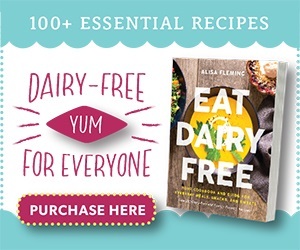 Dietary Notes: By ingredients, Hook Line and Savor entrees are dairy-free / non-dairy, egg-free, gluten-free, nut-free, peanut-free, and soy-free. See their FAQs for full details on their allergen protocols and processes. Keep in mind that processes and labeling are subject to change at any time for any company / product. 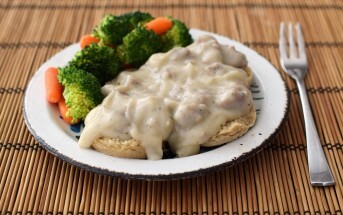 For More Product Information: Visit the Hook Line and Savor website at hooklineandsavor.com. I still do fish for my kids and this would be a perfect choice for them! I love that its not only GF, but also DF & EF. They all look delicious! So wonderful that these are allergy-friendly! I’ve had all three flavors. I think I place the breaded haddock as my favorite, with the Salmon being my second favorite. It’s perfect in fresh spring rolls! (Not as big of a fan of the sauce it comes with.) We made tacos with the cod the other night. Both the fish and the accompanying sauce have quite a kick. I love that these are free of so many additional allergens! Love the story and am intrigued by the product. 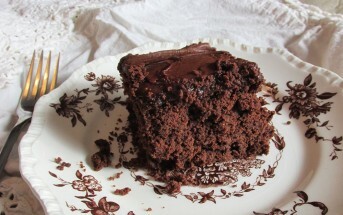 It looks delicious…everything! And I am so happy that it’s both gluten-free and dairy-free. Thanks for sharing this. It really is a fantastic product line. I hope you’re able to find it locally Jules! Oh Lordy!!! I’m soooo hungry now and it’s only 9:09 am! I am sad these aren’t out West yet, I guess I need to put in my request. 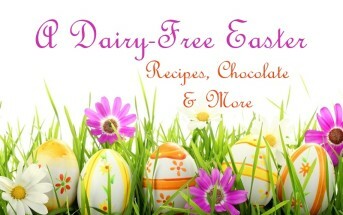 I’m trying to move away from meat products, but need to stay allergy friendly. Thanks for the heads up. I’m with you! Hopefully high demand will get these through distribution quickly!